well, my friends, I think I can officially state that osprey season has come to a close here in the Twin Cities. We checked nests this week and found Little Arb still present Monday morning, Sept 26, with no sightings that afternoon and then the cam got turned around so we cannot see the nest. I contacted someone at the Arboretum and they said they would pass the info along to the IT department, but the cam has not been refocused on the nest. One of the monitors also saw another one of our late fledging chicks and her Dad on Tuesday morning, but by Wednesday all the nests that I, and my volunteers, checked were empty. The last chick to fledge at the end of August was last seen on Sunday, Sept 25. We may still see a migrating Osprey passing thru of course. It's always a wistful time of year for those of us who spend so much time with these birds during the breeding season. I appreciate all the volunteer efforts, all the field work and all the camaraderie we all share here. I couldn't do this without a lot of help. I will start gathering the data and tabulating results later this winter. Hugs to you all...and bon voyage to all our winged friends. May you all meet with extraordinary good fortune on your journeys! End of the day on September 25, and Little Arb is still here! I visited several other nests today and found three chicks, on three different nests. One adult male was perched near his offspring, ignoring the nonstop food begging from a chick with a full crop! Another adult male delivered a fish to the very last chick to fledge this year...so all is well there and she has almost made it to that one month mark post fledge. On the third nest I observed only the juvenile, but she was food begging so in spite of my best efforts and 40 minutes, I could not spot the adult male. The winds are shifting to a WNW direction for the next few days, so this may end our Osprey season here. But, I will keep checking nests until no Ospreys can be found. Little Arb on the Arboretum osprey nest cam is still with us ...Food begging and waiting on the nest for some dinner to be delivered! I also ventured out today to visit the nest that held the last chick to fledge this year in the final days of August. The nest was empty. Their favorite dead tree was empty. I came back via another nest and found a chick still near her nest, eating a goldfish. I watched her for over an hour....can't explain why it's still fascinating to just watch an osprey eat a fish. What is most interesting about this chick is that she fledged by August 3, and is still here, being fed by her Dad! I expect these late fledges to still be around, but she has been flying for a long time and yet, does not yet feel the urge to head south. Interesting. Then I felt the pull to return to the other nest where the youngest chick should be...and sure enough, she was on the nest. She was quiet and I could not locate her Dad, but I was happy to see that she is still here. We have some northerly winds today, and they are predicting stronger winds from the NW for Sunday....so watch those winds....one of these days, a strong north wind will cause these birds to put out their wings and soar off towards their wintering grounds. I headed east to Wisconsin for one of my favorite pottery fairs today and when I drove over the bridge that spans the St Croix, an Osprey flew right over my car with a fish, and shortly after that another Osprey followed. By the time I pulled over I could not spot them. They are still around! So after visiting some potter friends, I checked several nests, including the one with the second to last chick to fledge. Yes yes, there was that beautiful female chick, hollering for food and dear old Dad delivered. Yeah! On to another nest nearby....same thing...a female chick on the nest and the male delivered a fish. I visited several more nests with no Ospreys seen or heard. Another nest had a single juvenile perched quietly on the nest....no adult seen. And the final nest I visited had a young female food begging...she soon had her request granted when the male arrived with a fish! She took it to her favorite tree to eat. So there ya go....four nests that had juveniles still present, at three of them I saw the male deliver a fish! I had good timing on this beautiful fall day... Golden sunlight broke out in the afternoon, with the perfect temps, low 70s, dry air, nice breeze, leaves beginning to turn. Nine Ospreys seen! Pretty good for September 17!!! ! I think I am the only one checking nests at this time....most volunteers have moved on to other activities, but I treasure these fall days with those beauties! Every Osprey I see at this time of year is a big fat cherry on top of this breeding season. Afternoon snack just delivered by Z3 to Little Arb....it's a BIIIIIIGGGGG fish. She took it and left....so she is learning to eat while perched somewhere other than the nest. I also visited a few other nests today....the last fledged chick could not be found but her Dad was there, in a tree eating a fish. When he finished the head, he flew a large display with the fish to attract the chick. He circled all around the nest moving further and further away from the nest and going higher and higher. No food begging was heard, and no chick showed up so he swooped back down near the nest and then disappeared into some trees, probably to eat the fish. This is how they look for their offspring. She only fledged a little over two weeks ago. Did she head south? (Unlikely so soon). Did she get into some trouble? (Possible). Or was she just out of sight, exploring! I hope so. I will check again soon. At another nest I found a juvenile with a big fish....no adults seen but I suspect she did not catch the fish by herself. A third nest I visited also had the adult male perched near the nest...just preening. Looking around. Waiting. He was there in case one of the youngsters needed him. So there are Ospreys still around to be observed, and interesting behaviors to learn from. I am so profoundly sad to learn that a man who mentored and inspired me in this osprey research died this past spring. Sergej Postupalsky was a deep source of information and encouragement to me for so many years. It's hard to find words to express his kindness, his real love for these birds, and his generous sharing of his 50 years of knowledge about the ospreys. I have a huge file of emails from him as well as all his published papers and I refer to them often. I had recently sent him a latter with my annual report and recieved an email from his daughter today. Oh how I wish I could have one more conversation with him. I met him when I traveled to Michigan to assist with their osprey reintroduction and Sergej and I got in a boat together to row to some of the tripod nests in the water to band and collect osprey chicks for translocation. I felt an instant sense of kinship with him. 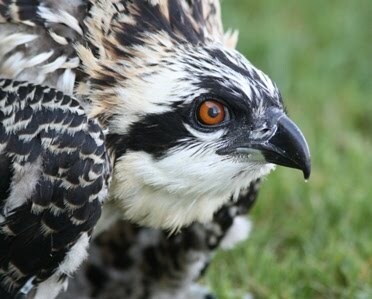 We remained friends, sharing annual reports and conversations about the Ospreys over the years. He was the one I always turned to when I was excited to share some behavioral observations. I will never forget the day that I thanked him for teaching me so much, and he replied "who is teaching who?" He never failed to support and encourage me. He is the one who encouraged me to publish my observations about extra pair copulation. What will I do without him? A gentle soul, a head full of knowledge, and a genuine passion for these birds. Oh how I will miss him. Ha ha eating seems to be ALL she does! She has a good Dad. This should reinforce what the Dyfi folks and I have been saying.....that many of these juveniles do not catch their own fish. They rely on their parents. I do think they may occasionally catch a fish, primarily male chicks, because they are hard wired to fulfill the role of provider, but they still rely on their parents to provide a large portion of their food. I have heard a so called osprey expert here say that a fledged chick can go catch a fish on its first flight....highly unlikely. Maybe impossible. After all my years of watching them, I think if an osprey chick flies off and does not return during its early flights, it probably met some sad fate rather than became totally independent so quickly. I am coming to the conclusion that the mortality rate in the first year may be higher than we think. (We are looking at doing a little more research on this during the winter). I do think they may begin accepting a fish from an adult someplace other than the nest though. So, I think it's a GOOD sign that little Arb is still on the nest so much and is eating so much. I think that actually may be increasing her chances of long term survival. The fatter and stronger she is when she begins her migration, when she will have to start catching her own fish, the more cushion she will have against failed fishing attempts. Her instincts are growing stronger everyday, and her frequent food begging does not mean she is too dependent...she is building reserves and developing in ways that may not be apparent. It's all good! Little Arb has been waiting and begging for a fish this morning, poking at that crusty old one that remains on the nest after about 4 days....finally the male delivered breakfast! As we are seeing here, these young birds usually don't go catch their own fish, and they rely on the nest post fledge as a place to get fed. This nest is still very much her "home base". They often remain dependent upon their parents for food, especially females. Yesterday I visited five nests, and I found four chicks and three adult males. Two nests had two chicks still hanging around their natal territory, food begging, waiting....and when the male delivered a fish a skirmish erupted for possession of the fish. On one nest I found the adult male perched nearby on a cell tower eating and looking around, sometimes displaying the fish in case any youngsters were in need of fuel. No chicks arrived so he ate. I visited his nest twice and never saw any chicks and he was eating a fish in different places each time. Clearly he is preparing for his departure. On two of the nests I found no Ospreys at all....where the polygamous male raised his two families. Perhaps they have all dispersed and begun the journey south. Little Arb is lucky that she does not have to compete for food. She will undertake her migration with a full tank! I expect her to be around for several more weeks...we hope anyway!